For all your boating needs! We offer the products and services you want. 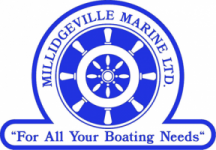 Millidgeville Marine opened its doors in 1989 – and since then we have been offing our expertise and knowledge that has been gained from over 45 years of boating – both sail and power, wood and fiberglass. We’ve updated our site to better serve our customers. Please have a look at the products & services – and let us know if you need any help with anything! Spring Launch Sale – April 8 – 13th! "Come by land, Come by water - Millidgeville Marine - For all your boating needs!"